Market capitalisation is the average of full market capitalisation of the stock on all recognised stock exchanges where it’s listed, or the full market capitalisation of the stock on the single exchange where it’s listed. Fund managers invest in companies as per the fund’s investment objective and investors know what they are investing in. For instance, mid cap growth funds are supposed to have asset allocation to mid-cap segment with a growth-oriented investment style and their portfolio must reflect this. This helps investors compare funds with similar mandate. Portfolio balancing must be done regularly since market capitalisation changes with stock price movement on the exchange. 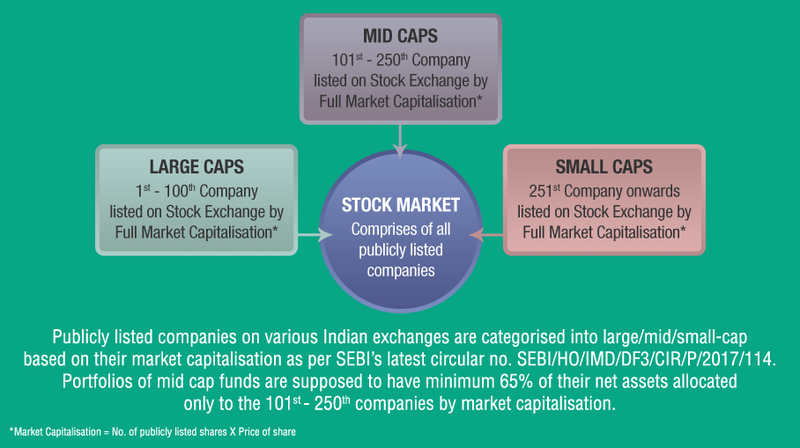 Mid Cap Mutual Funds invest in the mid cap companies with higher growth potential, but don't exhibit risks associated with small caps since these companies have attained certain scale and stability. Mid Cap Mutual Funds offer higher returns than large caps without being risky like small cap funds. While choosing best mid cap Mutual Funds, look beyond the recent 3-5 year returns for consistency of performance over longer periods and compare it with suitable benchmark returns.